Club Penguin Cheats by Mimo777 Club Penguin Cheats by Mimo777: New Club Penguin Clues in Command Room! hey now you can click on the screen and it changes to the sports channel and the weather and all those like the tvs on the igloos!but just while there are less than the 10 penguins needed to to make the movie play. even the thing that happened on the old epf screen in the channel where the two penguins are talking it say that thing: this conversation would be a lot more intresting with sound... huh? I saw Me Santa too. Wasn't he dressed as a dragon or something? man wish i saw u there. Its pretty cool though. Me and a couple friends tried to look for where all the entrences would be. ME TOO slippeestars! I SAW U!! THAT IS SO COOL! aww i was eating dinner i just saw the message after about 30 minutes. Yea me and my friend Slippeestars tried the same thing! I think Cp might be doing something with the hq soon, maybe a new mission? Hey Mimo you know that thrid pic of the places looks like that one place from GS SECRET MISSION when you get lost also my name in clubpenguin is Rookie Z just saying if you noticed me. Note:Im not the real Rookie duh! looks like more entrances to the EPF HQ cool! Oh me Rookie Z again yeah i know that third place was the cove and i was wondering mabye were we got lost in GS SECRET MISSION was in the other side of the mountainat at cove! 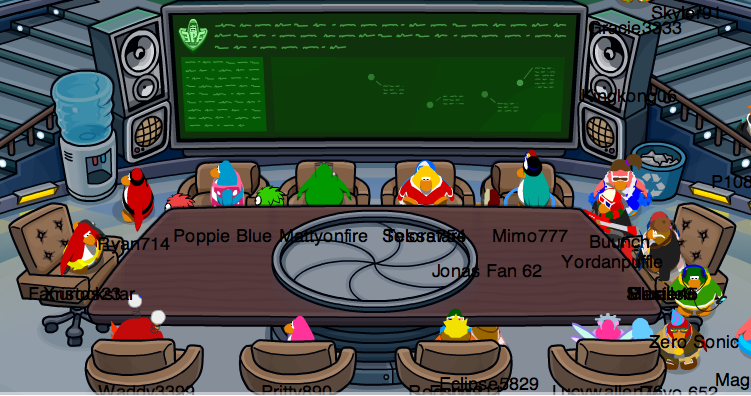 so maybe in the future CP will open that place! sweet...i cant wait i think its some sort of pudding tranfer device lol btw m i the only penguin who doesnt get paid for the epf?? I saw it in the EPF, and it looks like the EPF Elavator (in the everyday phoning facility). Except they are held by powerful coard (did I spell that right?) and they transport a similar way as to a ski lift (except we can't see the transportantion going on). And it all brings you to the epf. I'm guessing there will be a mission to unlock these things. It actually a new hideout. Just incase Herbert blows up the command room,we will have another hideout! And herbert will not know. Whoah. Everyone is seeing... everyone. Kinda creepy. 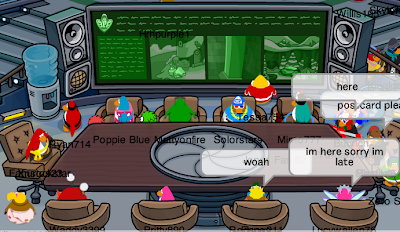 When you open the screen which two penguin talks, screen says "This conversation would probably be a lot more interesting with sound...huh?" Looks like new EPF entrances in the Cove and Beach. If you look in the top left corner of the EPF Room, there are two tv's with the Beach and Cove on. I saw the movie too! Now that I think about it, parts of the video point to a tunnel system under CP. If you click on screen in EPF HQ when the movies not on, diffrent pictures come up. Remember a while back when there was that picture of the gazebo by the town, and we thought it could be a new room? Well, I think that they are going to make that room, as a place to put a seprate entrance to hq!The one at the beach would also be an alternate entrance to hq.In the movie, it shows all locations going to one location. So these entrance tubes will probably just be quicker ways to get to hq. Maybe it will be a new mission! We would have to get all the parts to build the new entrances, build the entrances, and you have to do all that without herbert and klutzy finding these tubes to the hq. But, another theory on this is that we are making more hqs! One main hq, one for storing gadgets, and another for who knows what! Or it could be somthing completely wacko that no one could ever guess! Maybe the new room? The one that leads to the pizza parlor,puffle shop,and movie plays. Probably, it might come during the fair. When we LEAST expect it. Then herbert might mess that up! MIMO this might have some idea for the movie in the EPF command room. there are screens above the system scanner that show the beach and cove and two above field ops that show the phoninh faclity and the ski village. my name on club penguin is hamster sim. there are suspicous screens in the top two corners theres one of the beach, one of the cove one of the phoning falcity and one in the ski village but the ski village isnt in the movie huh?